Save the MOST when you order our SEVEN Most Popular Military Reference Titles together! Save $62.65! (Bundle the print and digital versions together and save $216.30!) 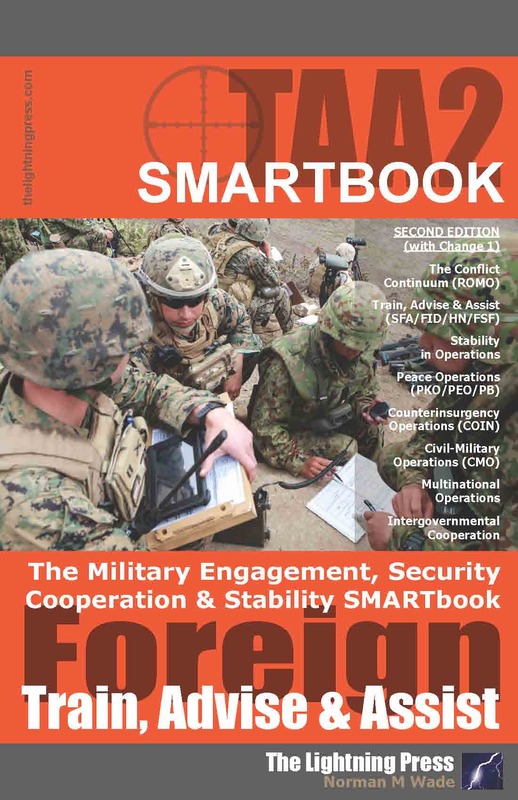 Includes the JFODS5: Joint Forces Operations & Doctrine; AODS6: Army Operations & Doctrine; BSS5: Battle Staff; SUTS2: Small Unit Tactics; TLS5: Leaders; SMFLS4: Sustainment & Multifunctional Logistics; and TAA2: Military Engagement, Security Cooperation & Stability (Train, Advise, Assist) SMARTbooks. 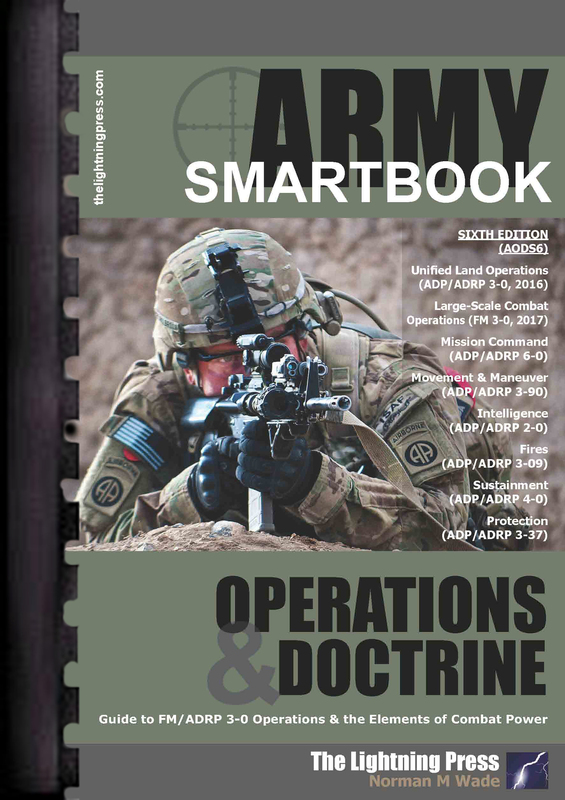 AODS6: The Army Operations & Doctrine SMARTbook (Guide to FM/ADRP 3-0 Operations & the Elements of Combat Power) is the new sixth edition of our Army SMARTbook. In addition to unified land operations (ADRP 3-0) and large-scale combat operations (FM 3-0), the 400-pg AODS6 includes completely updated and refocused chapters on the elements of combat power: mission command (ADP/ADRP 6-0), movement and maneuver (ADPs 3-90, 3-07, 3-28, 3-05), intelligence (ADP/ADRP 2-0), fires (ADP/ADRP 3-09), sustainment (ADP/ADRP 4-0), & protection (ADP/ADRP 3-37). An operation is a sequence of tactical actions with a common purpose or unifying theme. Army forces, as part of the joint force, contribute to the joint fight through the conduct of unified land operations. Unified land operations (ADRP 3-0) describes how the Army seizes, retains, and exploits the initiative to gain and maintain a position of relative advantage in sustained land operations through simultaneous offensive, defensive, and stability operations in order to prevent or deter conflict, prevail in war, and create the conditions for favorable conflict resolution. Unified land operations is the Army’s operational concept and the Army’s contribution to unified action. While the U.S. Army must be manned, equipped, and trained to operate across the range of military operations, large-scale ground combat against a peer threat represents the most significant readiness requirement. FM 3-0 expands on ADRP 3-0 by providing tactics describing how theater armies, corps, divisions, and brigades work together and with unified action partners to successfully prosecute operations short of conflict, prevail in large-scale combat operations, and consolidate gains to win. Decisive action is the continuous, simultaneous combinations of offensive, defensive, and stability or defense support of civil authorities tasks. Army forces conduct multi-domain battle, as part of a joint force, to seize, retain, and exploit control over enemy forces. Army forces deter adversaries, restrict enemy freedom of action, and ensure freedom of maneuver and action in multiple domains for the joint force commander. Combat power is the total means of destructive, constructive, and information capabilities that a military unit or formation can apply at a given time. To an Army commander, Army forces generate combat power by converting potential into effective action. Combat power has eight elements: leadership, information, mission command, movement and maneuver, intelligence, fires, sustainment, and protection. The Army collectively describes the last six elements as the warfighting functions. 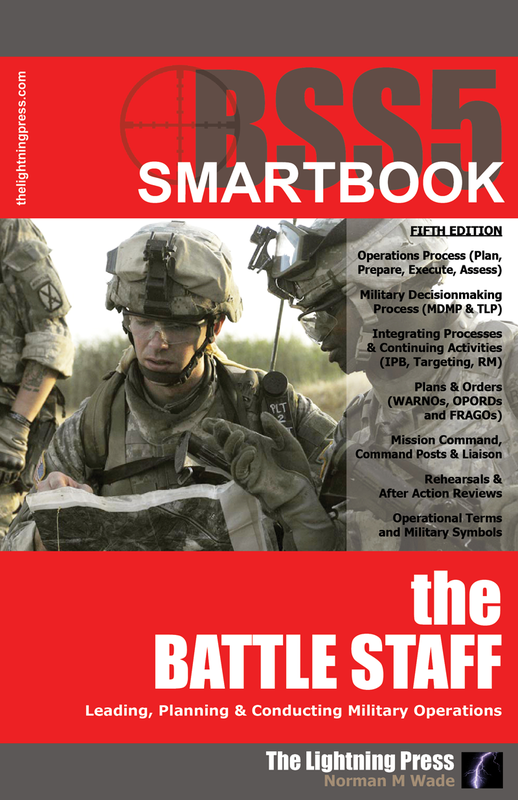 BSS5: The Battle Staff SMARTbook, 5th Ed. incorporates the full scope of new material from FM 6-0 (w/change 2), Commander and Staff Organization and Operations (May ‘15); ATP 2-01.3/MCRP 2-3A, Intelligence Preparation of the Battlefield/Battlespace (Nov '14); ADRP 1-02, Operational Terms and Military Symbols (Feb ‘15); FM 3-09, Field Artillery Operations and Fire Support (Apr ‘14); ATP 3-60, Targeting (May ‘15); and ATP 5-19 (w/change 1), Risk Management (Apr ‘14). Chapters and topics include the operations process (ADRP 5-0); commander’s activities (Understand, Visualize, Describe, Direct, Lead, Assess); the military decisionmaking process and troop leading procedures (FM 6-0: MDMP & TLP); integrating processes and continuing activities (IPB, targeting, risk management); plans and orders (WARNOs/FRAGOs/OPORDs); mission command, command posts, liaison (ADRP 6-0); rehearsals & after action reviews; and operational terms and military symbols (ADRP 1-02). * This is the third printing of BSS5 (dated Apr 2017), incorporating minor text edits from Change 2 to FM 6-0 (Apr 2016) and ADRP 3-0 (Nov 2016). An asterisk marks changed content. Commanders, supported by their staffs, use the operations process to drive the conceptual and detailed planning necessary to understand, visualize, and describe their operational environment; make and articulate decisions; and direct, lead, and assess military operations. The Army’s framework for exercising mission command is the operations process: planning, preparing, executing, and continuously assessing the operation. Planning is the art and science of understanding a situation, envisioning a desired future, and laying out effective ways of bringing that future about. Design is a methodology for applying critical and creative thinking to understand, visualize, and describe complex, ill-structured problems and develop approaches to solve them. Preparation is activities that units perform to improve their ability to execute an operation. Execution puts a plan into action by applying combat power to accomplish the mission and using situational understanding to assess progress and make execution and adjustment decisions. Assessment is continuously monitoring and evaluating the current situation and the progress of an operation. The military decisionmaking process (MDMP) is an iterative planning methodology to understand the situation and mission develop a course of action, and produce an operation plan or order. The MDMP helps leaders apply thoroughness, clarity, sound judgment, logic, and professional knowledge to understand situations, develop options to solve problems, and reach decisions. This process, consisting of seven steps with inputs and outputs, helps commanders, staffs, and others think critically and creatively while planning. Throughout the operations process, commanders and staffs integrate the warfighting functions to synchronize the force in accordance with the commander’s intent and concept of operations. Commanders and staffs use several integrating processes and continuing activities to do this. In addition to the major activities of the operations process, commanders and staffs use several integrating processes to synchronize specific functions throughout the operations process. The integrating processes are: intelligence preparation of the battlefield (IPB), targeting and risk management. A product of planning is a plan or order—a directive for future action. Commanders issue plans and orders to subordinates to communicate their understanding of the situation and their visualization of an operation. Plans and orders direct, coordinate, and synchronize subordinate actions and inform those outside the unit how to cooperate and provide support. Mission command is the exercise of authority and direction by the commander using mission orders to enable disciplined initiative within the commander’s intent to empower agile and adaptive leaders in the conduct of unified land operations. Mission command is one of the foundations of unified land operations. This philosophy of command helps commanders capitalize on the human ability to take action to develop the situation and integrate military operations to achieve the commander’s intent and desired end state. Rehearsals allow leaders and their Soldiers to practice executing key aspects of the concept of operations. These actions help Soldiers orient themselves to their environment and other units before executing the operation. An after action review (AAR) is a guided analysis of an organization’s performance, conducted at appropriate times during and at the conclusion of a training event or operation with the objective of improving future performance. The AAR provides valuable feedback essential to correcting training deficiencies. Feedback must be direct, on-the-spot and standards-based. TLS5: The Leader's SMARTbook, 5th Ed. incorporates the full scope of new material from FM 7-0 Train to Win in a Complex World, FM 6-22 Leader Development, and ATP 6-22.6 Army Team Building! 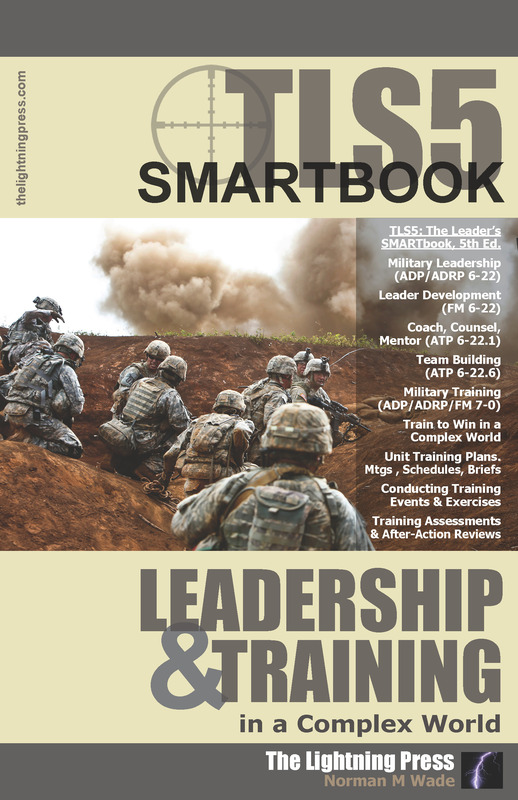 Jam-packed at 400 pages, topics and chapters include military leadership (ADP/ADRP 6-22); leader development (FM 6-22); coach, counsel, and mentor (ATP 6-22.1), team building; (ATP 6-22.6), military training (ADP/ADRP 7-0), train to win in a complex world (FM 7-0); unit training plans, meetings, schedules, briefs; conducting training events and exercises; training assessments, evaluations and after action reviews. 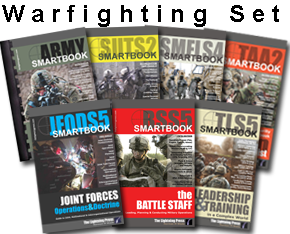 SUTS2: The Small Unit Tactics SMARTbook, 2nd Ed. 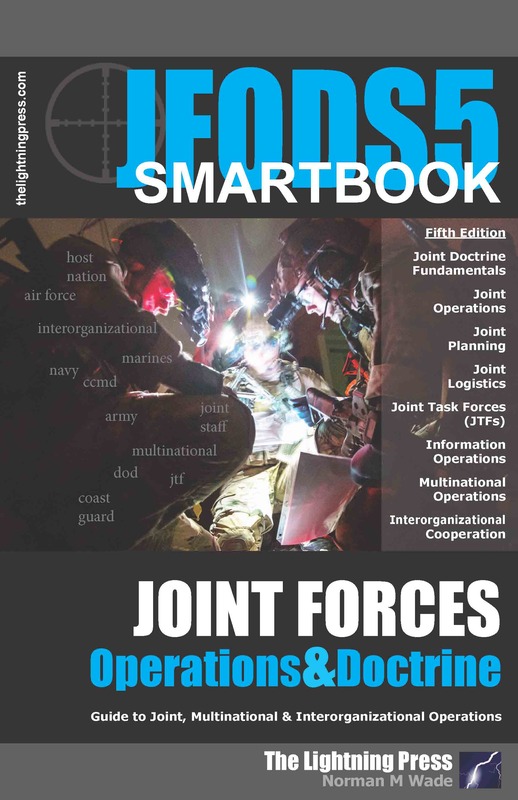 (with Change 1*) is the second revised edition of The Small Unit Tactics SMARTbook, featuring the full scope of new material and Doctrine 2015 updates to include ADP/ADRP 3-90 Offense and Defense, ADP/ADRP 5-0 The Operations Process, ADP/ADRP 6-0 Mission Command and more than 20 additional references. Chapters and topics include tactical mission fundamentals, the offense, the defense, stability and counterinsurgency operations, tactical enabling tasks (security, reconnaissance, relief in place, passage of lines, encirclement, and troop movement), special purpose attacks (ambush and raid), urban and regional environments (urban, fortified areas, desert, cold region, mountain, and jungle operations), patrols and patrolling. * Change 1 to SUTS2 (Mar 2017) incorporates additional material from ADRP 3-0 (Nov 2016), FM 6-0 (Chg 2, Apr 2016) and Train, Advise, Assist (chap 4). An asterisk marks changed pages. Establishing a common frame of reference, doctrine provides a menu of practical options based on experience. It provides an authoritative guide for leaders and Soldiers but requires original applications that adapt it to circumstances. The Small Unit Tactics SMARTbook translates and bridges operational-level doctrine into tactical application -- in the form of tactics, techniques and procedures -- and provides the “how to” at the small-unit level, providing a ready reference at the battalion, company, platoon, squad and fire team level. 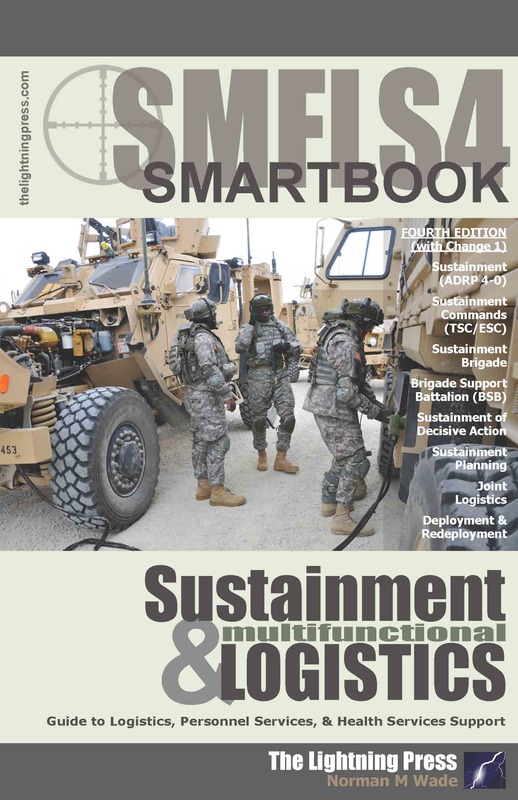 SMFLS4: The Sustainment & Multifunctional Logistics SMARTbook, 4th Ed. (w/Change 1*) is the fourth revised edition of The Sustainment & Multifunctional Logistics SMARTbook. In addition to the most current versions of ADP/ADRP 4-0 Sustainment (Jul ‘12), SMFLS4 incorporates the full scope of new material from ATP 4-94 Theater Sustainment Command (Jun ‘13), ATP 4-93 Sustainment Brigade (Apr ‘16), ATP 4-90 Brigade Support Battalion (Aug ‘14), Sustainment Planning, JP 4-0 Joint Logistics (Oct ‘13), ATP 3-35 Army Deployment and Redeployment (Mar ‘15), and more than a dozen new/updated Army sustainment references to include ATP 4-33, ATP 4-42, ATP 4-16, ATP 4-0.1, ATP 4-34.40, ATP 4-92, FM 1-0, FM 1-04, FM 1-05, FM 1-06, FM 4-01, FM 4-02, and FM 4-30! * Change 1 to SMFLS4 (Mar 2018) incorporates new material from ATP 4-93 Sustainment Brigade (Apr ‘16) and minor text edits from ADRP 3-0 (Nov ‘16). An asterisk marks changed pages. The sustainment warfighting function is related tasks and systems that provide support and services to ensure freedom of action, extend operational reach, and prolong endurance. The sustainment warfighting function consists of three major elements: logistics, personnel services, & health service support. Unified land operations acknowledges that strategic success requires fully integrating U.S. military operations with the efforts of interagency and multinational partners. The sustainment of unified land operations requires a continuous link between the strategic, operational, and tactical levels. It also requires close coordination and collaboration with other Services, allies, host nation, and other governmental organizations. Decisive action is the continuous, simultaneous combinations of offensive, defensive, and stability or defense support of civil authorities tasks. Commanders seek to seize, retain, and exploit the initiative while synchronizing their actions. Sustainment, through mission command, enables decisive action. Sustainment provides the operational commander with operational reach, freedom of action and endurance.